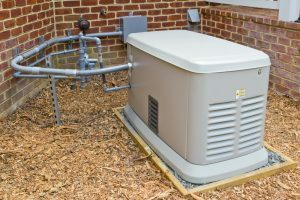 What Size of Generator Does My Home Need? Spring is always a good time to make big plans regarding your HVAC and electrical needs for your house. As the weather becomes warmer, you’ll have a nice window of opportunity where you won’t be dealing with temperature extremes. You can schedule updates and upgrades to your heating and cooling systems. Another job you can take care of is to install that whole-house generator you keep meaning to get. However, arranging for the installation of a whole-house generator in Chicago, IL isn’t as simple as pointing toward a unit and saying, “Let’s go with that one!” You have to make a few important decisions, such as what size (i.e. how powerful) a generator you need. There’s a lot of confusion among people about generator terms. For example, a portable generator isn’t the same thing as a whole-house generator. A portable generator is only able to power a small number of devices at one time. A whole-house generator (also called by a range of terms like a backup generator or standby generator) supplies power to all of the house and is permanently installed outside on a concrete slab. The size of a generator, like the size of an HVAC system, isn’t a measure of how much space the unit takes up. It’s a measure of how much electrical power it can provide to a house. The size of a whole-house generator is measured in watts of output. A small generator can produce 6,000 watts. One of the largest can produce 22,000 watts. That’s a big range, and it affects how many appliances in your house the generator will be able to handle when it turns on. When you work with a generator installation professional, they’ll work with you on deciding how much power you need. You may think you need less power than you do—many homeowners frequently underestimate how much electricity their home uses and which parts are essential. Most installers will recommend having a bit more electrical power than you think you need so the generator won’t run under excessive strain that may cause it to shut down during a blackout. However, too much power can lead to the generator shorting out the electrical system when it turns on, creating even bigger problems. Your installer will do a calculation based on the essential appliances in your home. You’ll probably want power for most of the lights as well as the refrigerator and the heating and air conditioning system. If you have family members who rely on powered medical equipment, make sure the generator can handle these. Once you’ve reached a decision about generator size with your installer—something that falls within your budget and will power the necessary appliances in your home—you can relax and leave the rest of the work to the professional. There are a few other choices to consider, such as the power source of the generator, but most of these are easy to decide. The professional will see your generator is set up and ready to go whenever you need it. ServiceMax is open all day, every day. Schedule all your spring electrical and HVAC jobs with us.